Every stoner’s soundtrack to the 90s, Latin hip-hop crew Cypress Hill continue their remarkable 2018 comeback with an inspired set of old-school meets modern. The haze in the room ripples, like a CGI time-warp. Everything glows violet; the poor visibility is not just down to dry ice. You could easily believe the smoking ban – the entire 00s – never happened. Superstar guest DJ Mix Master Mike, fresh off the Beastie Boys booktour, caresses the decks, deconstructing what sounds like Deep Purple’s Smoke on the Water into a bassy 90s jam. He’s standing in tonight for Cypress Hill’s own DJ and producer, DJ Muggs, who doesn’t tour any more but is still a resonant presence in this reinvigorated crew. 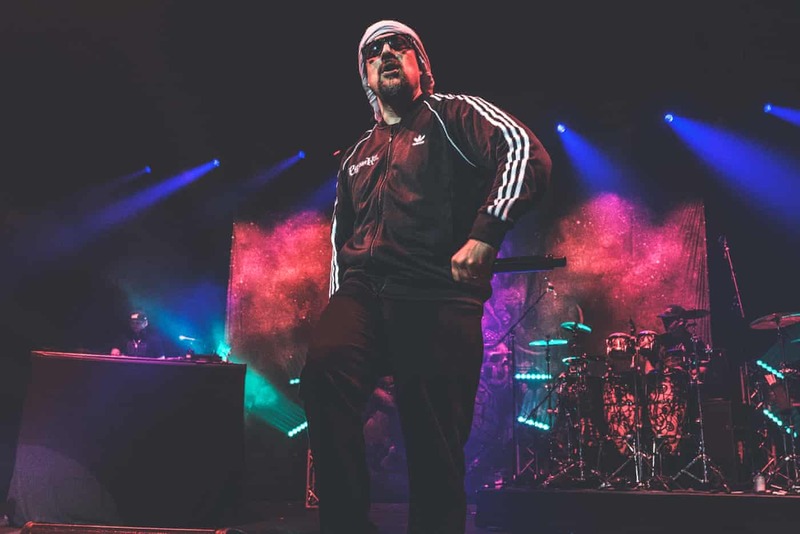 Engaged on multiple production fronts, Muggs returned to the Cypress Hill fold recently, primed with a Damascene musical conversion from his travels in the Middle East. It has relit the embers under this veteran hip-hop outfit like a flamethrower. As Mike unleashes the penetrating eastern Mediterranean strains of Cypress Hill’s newest album, time seems to shudder. We lurch backwards, into the eastern-tinged psychedelic rock that Cypress Hill loved before hip-hop, and forward into the present-day, where mahraganat artists make hip-hop-adjacent Egyptian street music, producer Diplo refashions world beats into mainstream bangers, and Syrian wedding singer Omar Souleyman soundtracks raves. A nightmarish elephant-god backdrop presides over the stage, its eyes lit ember-orange. Out of the shadows bounds rapper B-Real, in chunky shades with a white keffiyeh wrapped around his head, his nasal delivery untouched by the years. “You’re looking at the last of a dying breed,” he sneers. He is pretty lively on his feet for a thickset man of 48 with plenty going on outside of hip-hop. 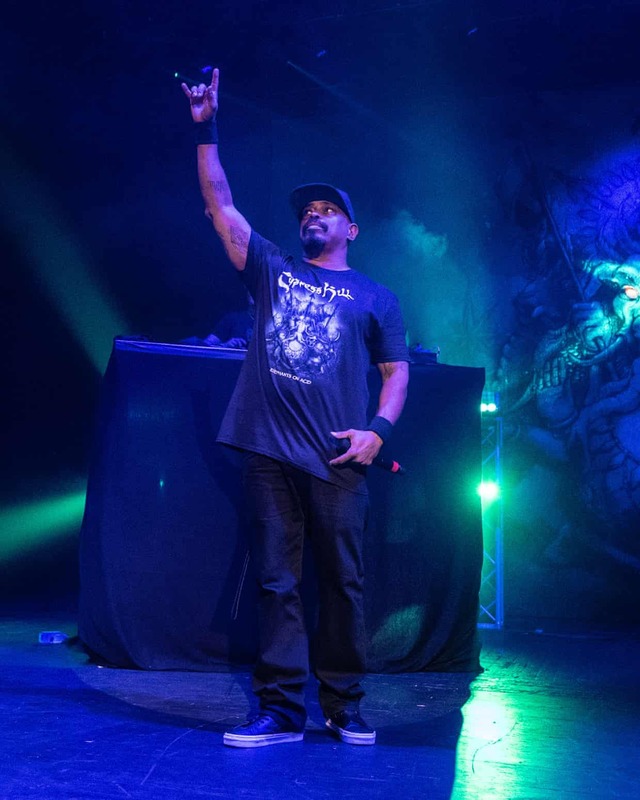 Fellow rapper Sen Dog, wearing his own merch, retains his gruff authority. “Everything you ever heard of is not a myth,” he huffs. Later on, the 53-year-old will dance a little salsa. At the back, longtime percussionist Eric “Bobo” Correa (also ex-Beastie Boys) throws himself around an array of drums, turning most beats faintly Brazilian. There are any number of people bouncing around who loved Cypress Hill back in the day. There are an equal amount of younger fans making sounds of approval you might hear at a grime rave. Games consoles have had a big role to play in keeping Cypress Hillfresh. It is, as they say, lit. Few rap comebacks in recent years have been as musically convincing as Elephants on Acid, this crew’s ninth album – not just good for a veteran hip-hop comeback, but actually aurally engrossing, a return to richly detailed boom after years of dabbling in rap-metal, side projects (most notably, B-Real is in Prophets of Rage with Chuck D and most of Rage Against the Machine) and non-musical business interests. Eminem’s Kamikaze relocated the august Detroit rapper’s mojo this year, going platinum, but those tracks lacked the unrelenting bounce of the reinspired Muggs (producer of House of Pain’s annoying but unrelenting Jump Around in 1992). There are no samples on the trippy Elephants on Acid; Muggs recorded musicians and looped from those originals, working with collaborators as diverse as psych outlier Gonjasufi and Sadat and Alaa 50 from the Egyptian underground. It’s a markedly different chemical state from most current hip-hop, slurry with Xanax, syrup and despair. It is, therefore, a shame that we get so little of Elephants during Cypress Hill’s clockwork-tight set. They have a deathless back catalogue of hits to get through – weed-hop anthem Insane in the Brain, from 1993’s breakout Black Sunday album; Rock Superstar, dating from their first comeback, 2000’s Skull & Bones – and are keen to finish at 10.30 prompt. A booming Elephants cut, Put ’Em in the Ground, fits right into the setlist, distorted menace to the fore. B-Real introduces the song diffidently. By the end he’s pleasantly surprised. “Maybe you have heard it,” he beams at the response. Cypress Hill have more than earned this state of bemused pleasure, having been not merely a great pop band, but at the forefront of at least two other cultural tides now hitting a crest. In 2018, Cardi B’s smash hit I Like It united the rapper (of Dominican and Trinidadian heritage) with Colombian reggaeton singer J Balvin and Puerto Rican trapper Bad Bunny in a Latinx triple-threat. But Gloria Estefan aside, the South Gate, California hip-hop crew were the first stars to incorporate their Hispanic heritage into their music, and decisively cross over. Much like everyone is spiritually Irish in a pub when the Pogues come on the jukebox, pretty much everyone in the room is right there with Sen Dog (born Senen Reyes) as the Cuban-American Spanglishes his way through tracks like Latin Lingo off the band’s 1991 debut. Sen Dog emigrated to the US as a child; legend tells that B-Real’s Cuban mother came to the US on a raft. Those parents’ fondest hopes must have been dashed, then rocket-propelled. The young B-Real (born Louis Freese) got shot in the lung back when he was in a Bloods sub-gang. An inspired rendition of Lick a Shot provides further details tonight as Bobo adds carnivalesque percussion. Not only did these teenage gang members survive, the world they hoped for might just be coming to pass, in some small part, through the cultural work of their music. “I guess you guys would say ‘mental’, right?” notes B-Real, at one point.